My Wire Came Loose and is Poking, What Do I Do? It’s the weekend. Something just happened with your braces and it feels odd. Then you notice, a wire is poking your cheeks. Ouch. Orthodontic breakage is common and can happen at inconvenient times. 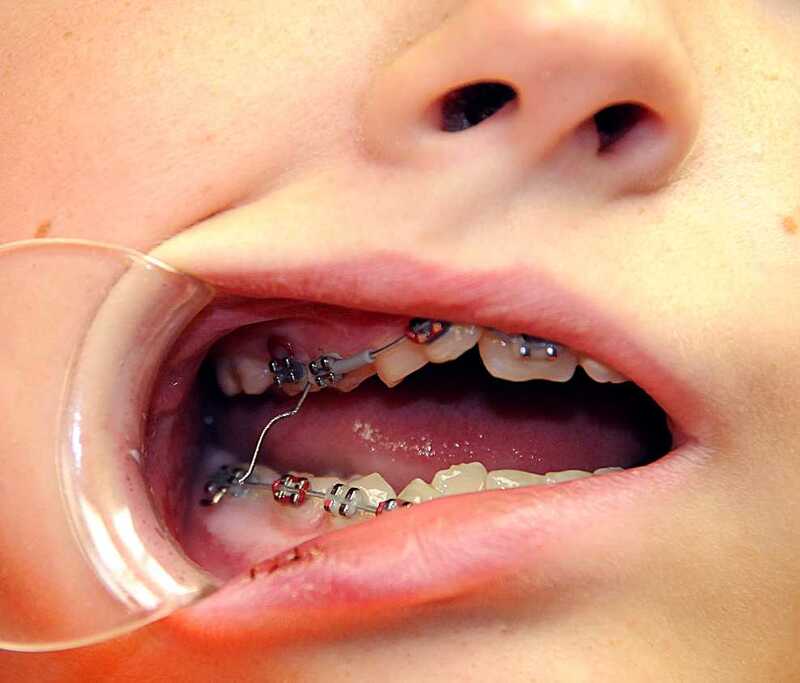 Most orthodontic patients will have problems with their wires during treatment with braces. Usually orthodontists give instructions on what to do when something like this happens. You need to follow their instructions. If not, this article has some suggestions to help make your child or yourself comfortable until you see your orthodontist for repairs. What are the most common problems with braces? 1. The most common problem during braces is a bracket coming off of a back (posterior) tooth, the wire is loose. Sometimes, the wire will not irritate your cheek and really nothing needs to be done. In other cases, the wire is jutting out towards the cheeks and is poking. A bracket is the rectangular metal piece that is attached to the tooth with adhesive. 2. Another common problem is when a wire flexes away from the braces when chewing food and the wire slides out of the last posterior molar bracket. It’s just hanging there. This can be a problem that has to be fixed. If it is not completely out of the tube of the last bracket, just push it back into place with your fingers. This occurs mainly in the beginning of treatment when an orthodontist is using very light thin wires that are very flexible. 3. Finally, the wire shifts to one side of the mouth. 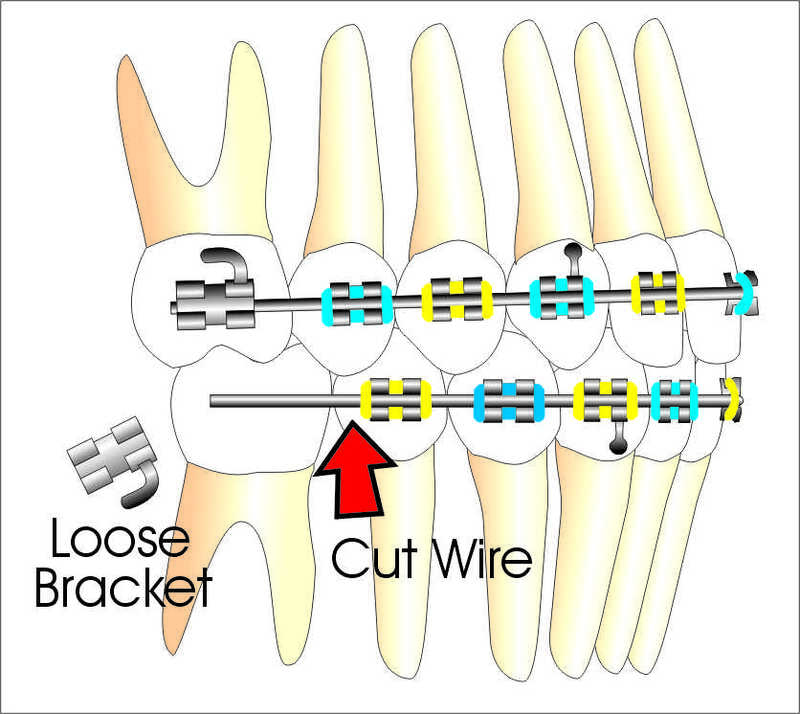 With the very first wires used in orthodontic braces, the thin wire can shift to one side or the other. This makes the wire long on one side and starts to irritate the cheek tissue. In this situation, you need to cut the wire if you can. Or place cotton or wax on it. The cotton or wax can be used during sleep until you can see the orthodontist. Here are some of the things you can do, if your orthodontist has not specified an action to take. When chewing food, the wire will some times bow or flex out towards the cheeks. It’s not completely away from the molar bracket. In this case, use your finger to push the bowed wire back into place. You can use a toothpick or eye brow tweezers to move the wire. This happens usually during the beginning of treatment when the wires are very flexible. In cases where the wire is poking, you can cut the wire closest to the nearest bracket that is attached. 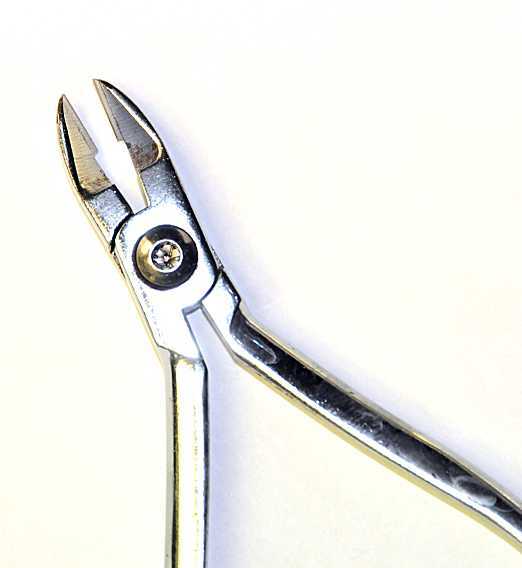 You can find simple wire cutters at your local hardware store that can cut the wire. Remember, to wipe the cutter off with alcohol. Also, as you are cutting the wire, place your finger on the wire you are cutting off so that it doesn’t fly off towards the back of the mouth. Make sure that you feel comfortable in cutting the wire. If not, don’t. 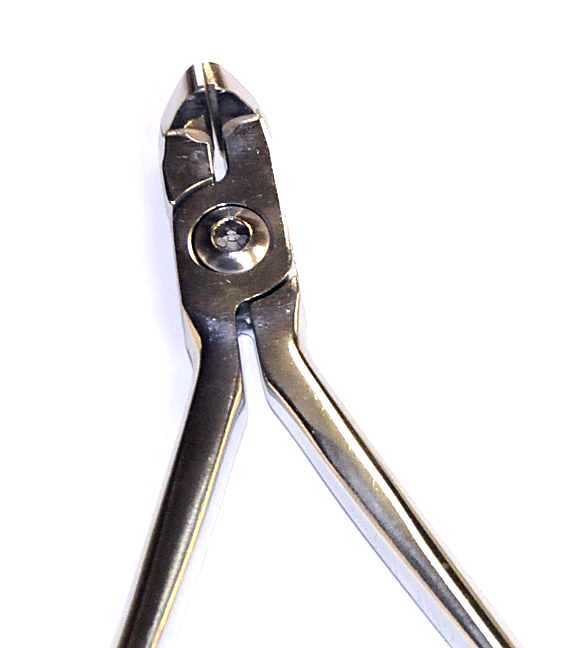 A distal end wire cutter is a special plier an orthodontist uses to cut the wires in the back of the mouth. The nice feature of a distal end cutter is that it holds the wire after you cut it so the wire doesn’t fly off to the back of the mouth and down the throat. There are some companies that sell distal end cutters to the public. 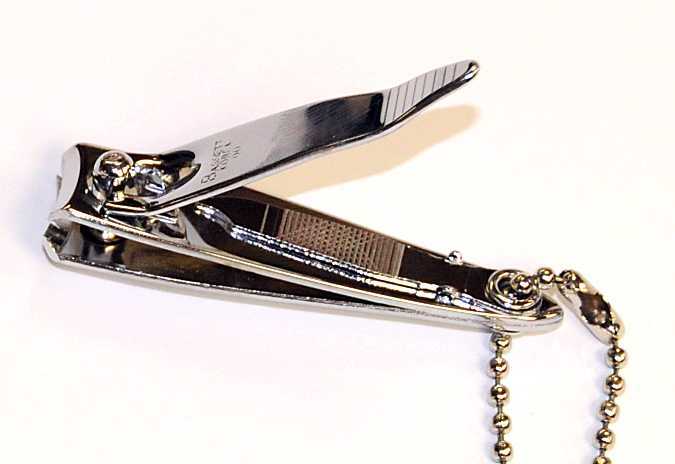 You can also use finger nail clippers to cut the wire. Some orthodontic wires are hard to cut. A multi-braided wire is hard to cut and they are used in the very beginning of treatment. At the end of treatment, heavy thick wire are used and are difficult to cut. In cases where you do not want to cut the wire, try to bend it in a different position to where the wire is not poking. Use your fingers, a blunted toothpick or a broken pencil tip or eraser head. If all else fails, you can place a cotton ball, gauze or wax on the wire. Orthodontic wax is good for this problem if the wire is not too long and way out of position. If the wire is not poking you and you are not in any pain, just call your orthodontist to schedule an appointment for repair. A wire that is loose and not hurting can wait and is not a dental orthodontic emergency. ← Previous Previous post: How Do You Treat White Spots After Braces? Next → Next post: What are the Types of Malocclusions? I'm here to answer your orthodontic questions. How Do You Treat White Spots After Braces? How are Hawley Retainers Made? How Long will My Braces Hurt? What Colors Do Braces Come In? What are Impressions for Braces? What is a Rapid Palatal Expander? Can I Chew Gum with Braces? Do I Have to Loose All the Baby Teeth to Start Braces? What Age Should a Child See an Orthodontist? What are Separators, Spacers & Orthodontic Bands? My Lower Fixed Retainer Fell Out! What to do? Why are Braces So Expensive? My Wire Came Loose and is Poking. What Do I Do? What is a Supernumerary Tooth? What Do the Elastic Rubber Bands on Braces Do? What is Tooth Fusion & Gemination? Can I Play Sports with Braces on my Teeth? Copyright © 2019 Ask an Orthodontist.com. All Rights Reserved.